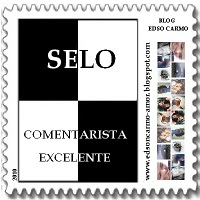 Bhavesh Chhatbar of Chaukhat.com BLOG has given me this Selo Commentarista Excelente Award. Thank you Bhavesh! Thanks a lot for this really kind gesture! I feel honored! Thanks a ton Nalini... Thtat my first blog award ever. Thanks a lot for the award. Its my first..and i had not expected it to come my way this soon..
Really appreciate it and i feel humbled. Please dont get me rude, but i am not very familiar with these award things and i dont really know what one is supposed to do with them. @Arti...please open up comments on your blog...and also add email on your profile. Thank you for the award. Thank you again for your consideration. © Nalini Hebbar/saycheese/2009-all rights reserved. Powered by Blogger. Copyright SayCheese 2009. Wordpress Theme by wpthemedesigner . Converted To Blogger Template by Anshul .